It could be powered by a flat-four engine. The three-wheeled NeoWing adopts Honda’s sharp and angular design language. It looks like a laid back cruiser, much like the Honda Gold Wing. Two-wheeler manufacturers have been playing around with the idea of three-wheeled transportation for a while now. 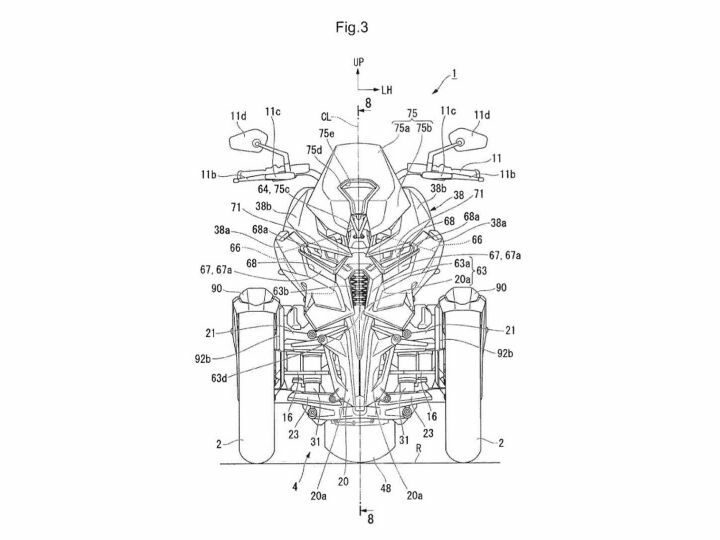 The latest update on this front would be the recently filed patents from Honda for its tilting three-wheeled motorcycle. The company first showcased its trike concept back in 2016 and christened it the “NeoWing.” It featured a reverse trike configuration, two wheels up front for steering and a single rear wheel connected to the engine. Sounds familiar, right? The Yamaha Niken might ring a bell. It’s Yamaha’s interpretation of a trike that was developed to make riding easier for beginners. Essentially, riders can lean into corners (upto 45 degrees) without worrying about losing the front end. The bike’s unique linkage system on the front two wheels gives it the ability to lean into corners like a regular sports bike. Furthermore, the Niken uses the same 874cc, inline three-cylinder motor from the MT-09. It dishes out 115PS at 10,00rpm and 87.5Nm of torque at 8,500rpm. Honda, on the other hand, has taken a slightly different approach with the NeoWing. 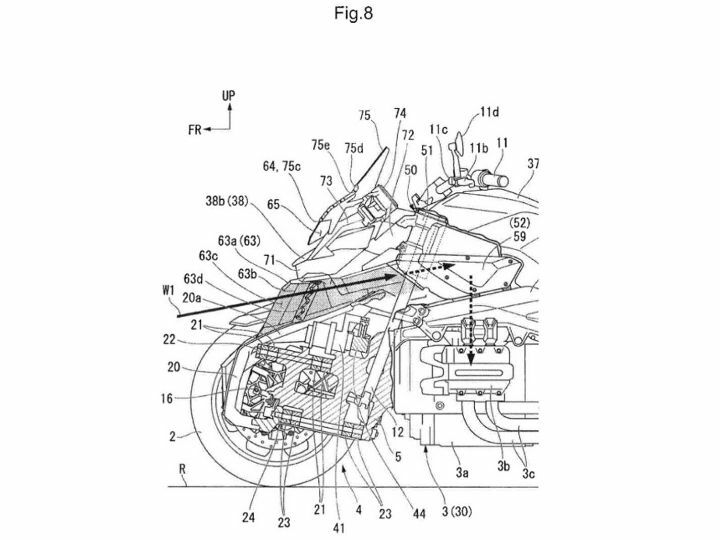 To begin with, the patent images showcase a flat-four engine layout which seems to be based on the Honda Gold Wing’s flat-six 1833cc engine. Perhaps a 1200cc engine then? But there’s also talk that this could end up being a BMW-style boxer-twin, or a full-blown opposed-six. Besides this, the NeoWing also features a shaft drive and some say that it might even get a hybrid powertrain. Either way, Honda appears to be taking the top-down approach which means it’ll enter the trike market with a premium offering, positioned well above the Niken. And depending on the response, the company will go down the ladder into smaller capacity trikes. 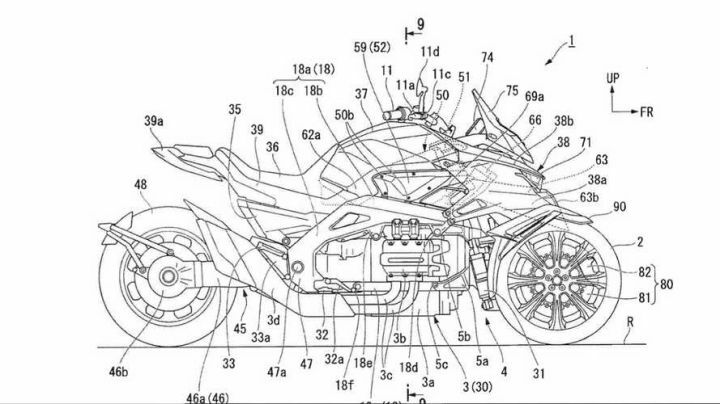 Essentially, creating a trike that slots in as a halo product, it seems Honda is trying to make the idea of such unusual machines more desirable. In terms of design and ergonomics, the NeoWing adopts Honda’s new design language with sharp angular lines running from the front to the end. Its ergonomics hints at a laid back cruiser which sits low on the ground, much like the Gold Wing. The trike also features LED lighting, dual-tone alloy wheels, double-barrel exhausts on both sides and a tyre hugger-mounted number plate. Knowing Honda, we could expect a majority of the design and components to make it into production.